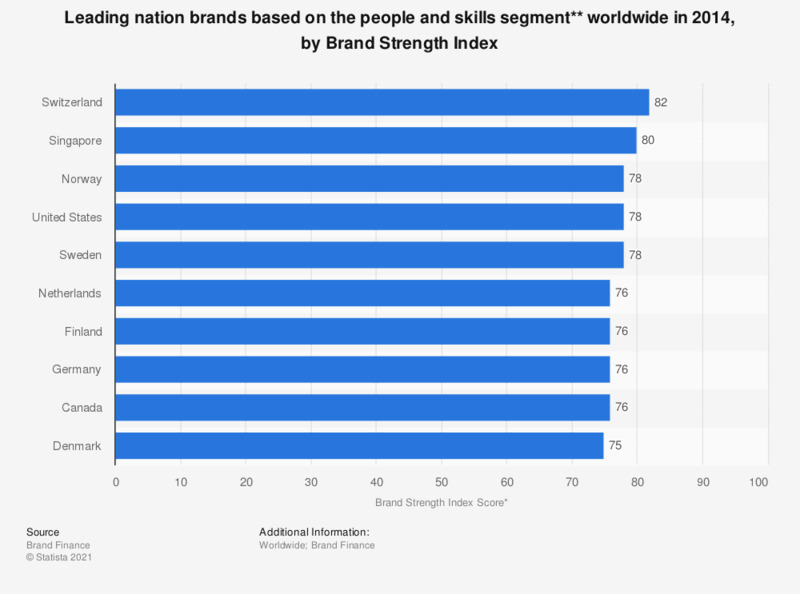 The statistic depicts the top ten nation brand performers in the people and skills segment in 2014, measured by the Brand Strength Index (BSI). In 2013, Switzerland received a goods and services segment BSI score of 82, higher than all other nations that year. ** The Brand Finance Nationa Brand Impact Framework identifies the 4 segments that enable countries to identify, build and unlock the potential economic value within their nation brand. These 4 segments (investment, tourism, products & services, people & skills) each have a crucial role to play in leveraging and improving a Nation Brand's ability to enhance GDP growth.